A small, toothy fish, which researchers say resembles the terrifying creature from the movie "Alien," is turning out to be a big mystery for the scientists who study it. 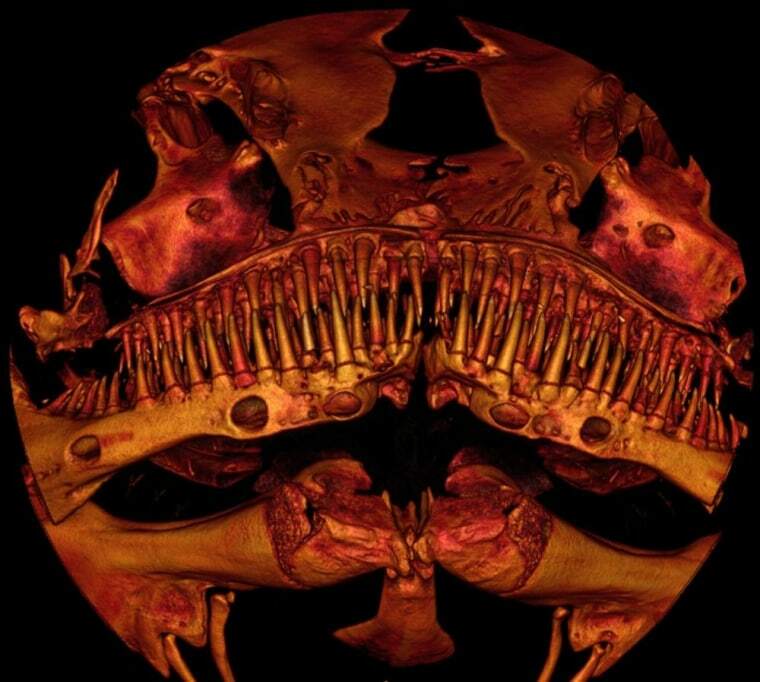 Kryptoglanis shajii is a tiny, subterranean catfish with a number of defining skeletal features, including a bulging lower jaw similar to a bulldog's. The subterranean dweller is so elusive that scientists didn't categorize it as a new species until 2011. "The more we looked at the skeleton, the stranger it got," John Lundberg, emeritus curator of ichthyology at the Academy of Natural Sciences of Drexel University in Philadelphia, said in a statement. He and his colleagues used digital radiography and high-definition CAT scans to study Kryptoglanis' bone structure. Some of Kryptoglanis' bones are shaped in a way not seen in any other fish species. Numerous bones in the catfish's face are modified, giving it a compressed front end with a jutting lower jaw — similar to a bulldog's snout. The tiny fish also possesses four rows of conical, sharp-tipped teeth. Lundberg speculates that there's a functional purpose behind all the strangeness. "In dogs, that was the result of selective breeding," Lundberg said. "In Kryptoglanis, we don't know yet what in their natural evolution would have led to this modified shape." Lundberg and his colleagues report their findings in the 2014 issue of the Proceedings of the Academy of Natural Sciences of Philadelphia. This tiny catfish (Kryptoglanis shajii) from India is just 4 inches (10 centimeters) long.Academy of Natural Sciences of Drexel U. This is a condensed version of a report from LiveScience. Read the full report. Follow Elizabeth Palermo on Twitter, Facebook or Google+. Follow LiveScience on Twitter, Facebook and Google+.